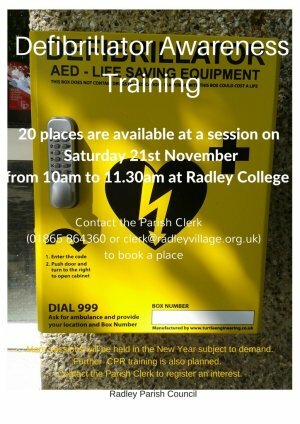 20 places are available at a defibrillator awareness training session to be held on Saturday 21st November from 10am to 11.30 am at Radley College. Places must booked in advance by contacting the Parish Clerk by email or phone. Training will cover use of Public Access defibrillators and basic CPR. The Parish Council hopes to run another session in the New Year, and Councillor Shaun Betts’ will be running his British Heart Foundation sponsored CPR training regularly throughout the year.